Compare Activa 3G, i, 125 vs TVS Wego – When you are confused with a new comer, all you need to have some research over this. 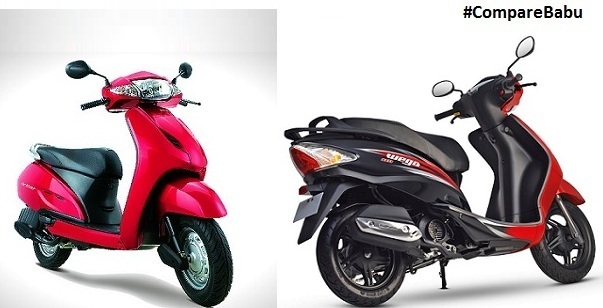 In this article, we are going to compare Honda’s Activa series and TVS Wego. Just read this article and in the end of this article, you will be able to decide what could be the best for you or your relatives. By the end of the article, you will be able to decide whether it is a WE time for you or you will have to go with one of those Honda’s Activa series. Price is always an important factor while purchasing a scooter. In Delhi, Activa 3G’s ex-showroom price is INR 49,900 whereas TVS Wego is tagged at INR 50,209 in the ex-showroom. Mileage is 42-52 kmpl for Activa 3G. But, TVS Wego gives a mileage of 40-55 kmpl on Indian roads. TVS Wego does not actually has an edge in the mileage section of this comparison as the mileage might come down to 40 kmpl as well. Fuel tank capacity of Wego is 5 litres whereas Activa 3G has 5.3 L of fuel tank capacity. In terms of cc engine, no one is a clear cut winner. Both flaunts 109 cc engine. But to be exact, TVS Wego has 109.7 cc engine in it. In terms of top speed as well, both the scooters touch the same level of top speed i.e 85 kmpl. Ex showroom price of Activa 125 Dlx is around INR 60,500. TVS Wego is tagged at INR 50,209 in the ex-showroom. There is a price difference but Honda Activa 125 has a lot to offer as compared to TVS Wego. Activa 125 has a mileage of 50 to 55 kmpl. Wego gives a mileage of 40-55 kmpl on Indian roads. Activa 125 has a clear edge in this category. Even fuel tank capacity of Activa 125 is 5.3 L when compared to fuel tank capacity of 5 L in Wego scooter. Activa 125 has a 125 cc engine whereas TVS Wego has a comparable cc engine to Honda’s 3G model. Wego has only 109.7 cc engine. Activa i is available at a price of INR 47,000 in Delhi ex-showroom. TVS Wego is tagged at INR 50.209 in the ex-showroom of Delhi. In terms of mileage, Activa I gives a whooping mileage of 66 kmpl whereas TVS Wego gives mileage of 40-55 kmpl. Even the fuel tank capacity of TVS Wego is 5 L whereas fuel tank capacity of Honda Activa I is 5.3 L.
Activa I has not been designed for cc lovers. It has only 102 cc engine whereas Wego flaunts 109.7 cc engine. In terms of top speed, Wego is slightly better. It has top speed of 85 kmph whereas Activa i has a top speed of 82 kmph only. Verdict: Any model of Honda Activa series is a better choice than TVS Wego. So, we advise you to buy Honda Activa series’ scooters over TVS Wego.